Advanced Serial Data Logger inputs RS232 data directly into file, Excel, Access, or any Windows application. Advanced Serial Data Logger provides real-time data collection from any serial device or instrument. Send and receive RS232 data across a RS232 port or RS485 port with hardware converter. Data query modules. Advanced Serial Data Logger also transmits requests or commands out the serial port to control or query your instruments directly from Advanced Serial Data Logger over ASCII (by default) or MODBUS protocol. Think of Advanced Serial Data Logger as a fully customizable serial I/O device driver. Windows service mode. 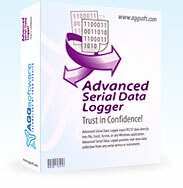 Advanced Serial Data Logger also is a Windows 2000+ service that records all data received on a serial port to a file on a disk or to other targets so that it starts as soon as the operating system starts and doesn't require a user to log in and run it. It will continue to run even as users logon and logoff the workstation. However, Advanced TCP/IP Data Logger is generic enough to be useful whenever one-way serial traffic needs to be recorded. It is extremely easy to use! The configuration process is fully menu driven and has complete, context sensitive, on-line help. You can easily customize all input to your exact specifications. Once you see how easy it is to use Advanced Serial Data Logger, you will never again take data readings by hand!